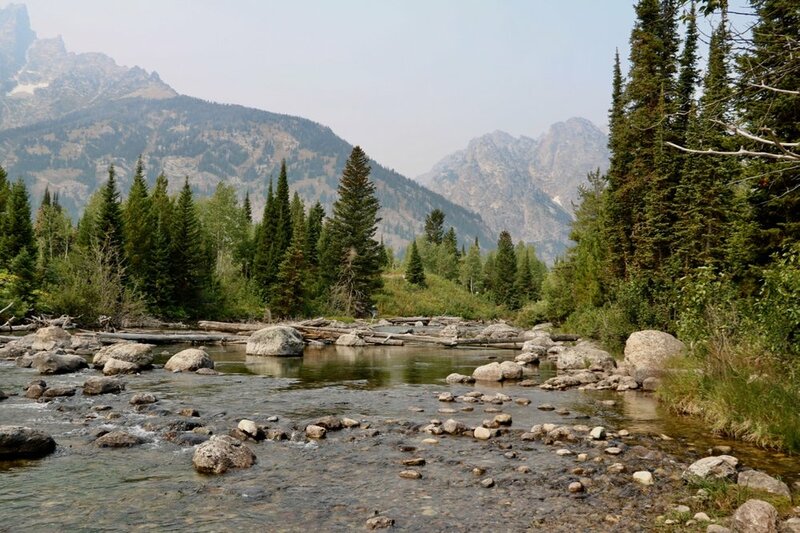 A mere 20 miles south of Yellowstone, winding my way down the John D. Rockefeller Memorial Parkway, I found myself in a very different landscape as I entered Grand Teton National Park. 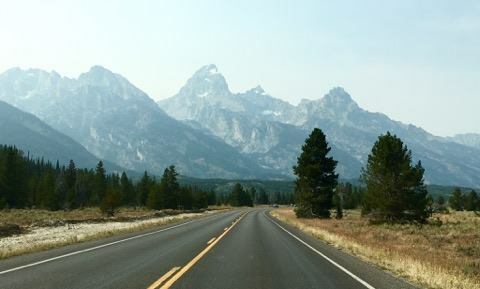 With stark intensity, the Teton Mountains jaggedly rise before you almost 14,000 ft. with their raw and ragged beauty. The dense pine forest thickens to hide deer, elk, bear and bison with great expanses of willow bushes that lure moose out into the open. More than any place I have visited so far, Grand Teton is all about the relationship between land, water, and sky. The majestic mountains rising from and reflecting upon the series of lakes (Jenny, String, and Jackson) along with the snake river weaving its way through land and stone. The sky above a swiftly shifting stage above and around the peaks, constantly changing the color and mood of the landscape. Grand Teton is serene and quiet in comparison to the hustle and bustle of Yellowstone, but that does not equate to dull or boring by any means...Where the crowds of Yellowstone were "viewing", those that visit Grand Teton are "doing"! From fishing, paddling, and floating, to riding, biking, and climbing, people come to this park to get out in the landscape and get busy, and trust me Grand Teton provides those opportunities by the bucket load. I quickly realized that the best way to experience this park and it's people was not as a casual viewer but as someone jumping in with both feet! Over the course of the next few days, I hiked, climbed, rode on horseback and hit the water in search of the true Teton experience. After claiming my highly sought ofter campsite at Jenny Lake, I began with a 7.5 mile hike around the lake, chatting up fellow hikers and rangers alike. Here I met Julia, a rookie Park Ranger who managed to land her first major assignment in Grand Teton and she just oozed with excitement and enthusiasm for her new career path. Fresh out of college, she is full of hope and determination to represent the parks and help preserve these sacred places. When asked why she choose this career path, she said she thinks it is some of the most important work that needs to be done for her generation (and I believe she's right!). fellow hikers came in all shapes and sizes - young families with little ones strapped to their backs, older couples get on at a leisurely pace, physically fit 30 somethings blowing past, and everything in between. Some were their for the first time, while others were frequent flyers of the park using it as an active escape into the great outdoors. Unfortunately as my first day progressed, the hazy smoke from wildfires to the north settled in at Grand Teton for what would be a long stay, muting the dramatic vistas in a merely light. Not the greatest case scenario for the plein-air painter as the blotted out views didn't make for dramatic compositions, but it did give me time to plan, sketch, then get back out in it as an active participant in all the park had to offer. Day two found me mounting a horse (named Pig Pen!) for the first time since Girls Scout Camp at age 10 - goal: to survive a two hour trail ride from Jackson Lake Lodge up through the mountains to Oxbow Overlook and back. Luckily, Pig Pen was a kind, slow going mare and we got on just fine to make for one of the most amazing experiences of my trip so far...there is nothing quite like making your way through this breaking landscape on horseback! My trail guide, Taylor, was an amazing ambassador for the park with great knowledge of the landscape and historical facts to share. We were able to ride along sharing life stories and experiences as we went with great mutual admiration for each others path in life. The smoke stayed lodged in the park for another day, so I took to the water first to befriend some fly fisherman and learn about the grand tradition of fly fishing in this area. An art form all its own, I spent a lot of time watch, waiting and absorbing the landscape with my camera and pencil, wading in the water, walking up the riverbed, investigation fish and birds, and exploring the park from a different point of view. Paintings will come from photos, sketches and memories of the experiences here - though not necessarily from a perfect blue sky plein-air moment. Grand Teton National Park had done an amazing job of educating the public about the importance of conservation and protection of these public lands, including important figures that played a part in the protection of this particular park or conservation in general throughout the U.S. These people include John D. Rockefeller Jr. who helped to set aside these particular acres, Olaus and Mardie Murie - naturalists and conservationist who ranch is a historical landmark in the park, Stephen Tyng Mather - who laid the foundation for the national park service, along with honoring the Native American heritage of the area and the history of the homesteaders who settled here. For more about it click here: Grand Teton Cultural History Grand Teton also has multiple tributes to two important artists/activist/conservationists that made their way to this area to immortalize the landscape through paint and photography - Thomas Moran and Ansel Adams. It was very apparent that promoting protection, preservation, and action was on the forefront of the message at Teton and with that, people were very receptive of my project and my willingness to basically drop everything to go on this 40 day pilgrimage into the wilderness. To quote one ranger here, "out of sight, out of mind is a dangerous thing when it comes to protecting the parks...if I had it my way, every senator, representative, cabinet member, and EPA administrator should have to come out here and see these places with their own eyes, experience the wonder of it like you are....If they did, I don't think we would be having these conversations about deregulation, shrinking of size, and removing protections to OUR lands and the wildlife that live here. Newer PostRocky Mountain National Park! Older PostYellowstone - America's first park!